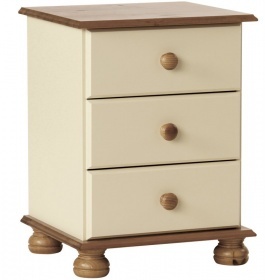 Attractive cream bedside table with a contrasting oak veneered top and round wooden handles. 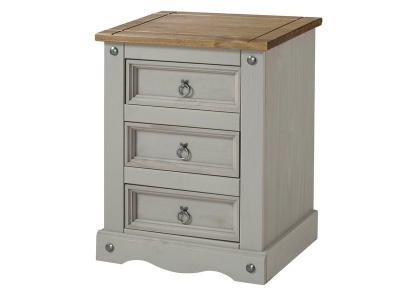 Two good sized drawers to keep all your bedside accessories close by. Dovetail drawer joints and solid wood drawer runners for extra durability. 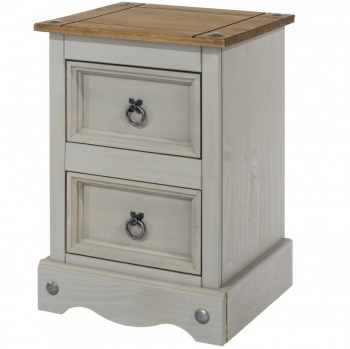 The Jamestown bedside table is produced predominately from veneered plywood, pine and painted MDF. Solid wood convex handles. Plywood drawer bases and cabinet back. Colour: cream and mellowed oak. Flat packed for home assembly full instructions included. It typically takes one person 20 minutes to assemble the Jamestown bedside table. Delivered in one box. The boxed dimensions are: H114 W581 D437 mm. Part of our painted white bedroom furniture collection.